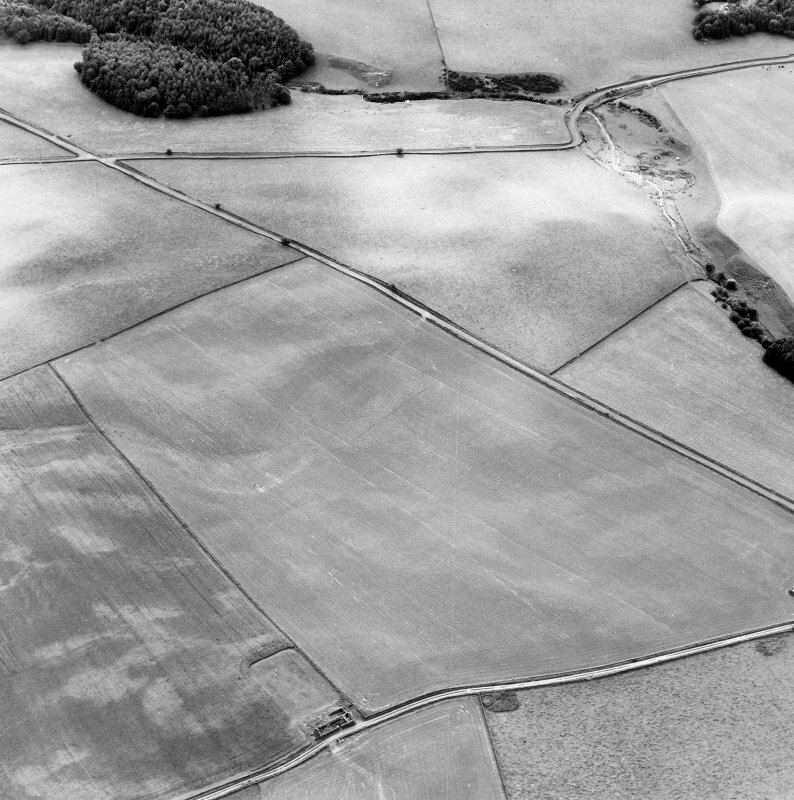 Oblique aerial view of Durisdeer, taken from the SE, centred on the cropmarks of a Roman Temporary Camp. 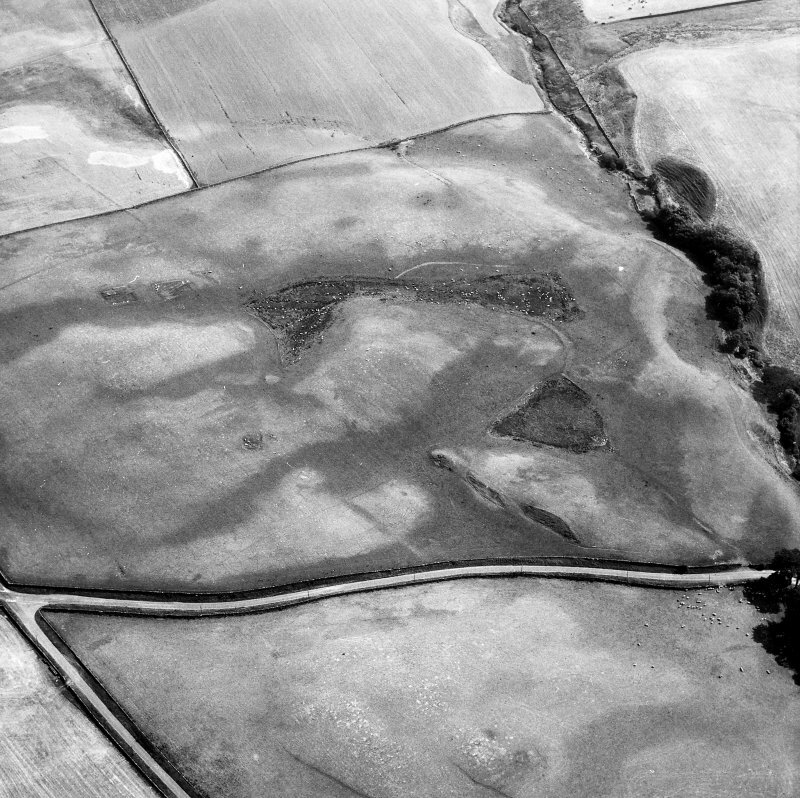 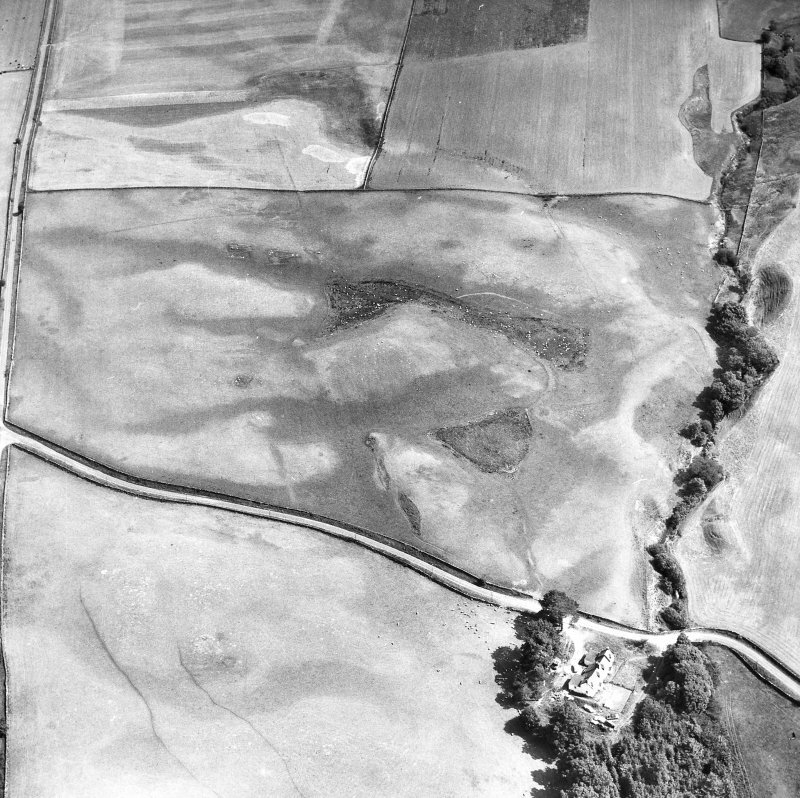 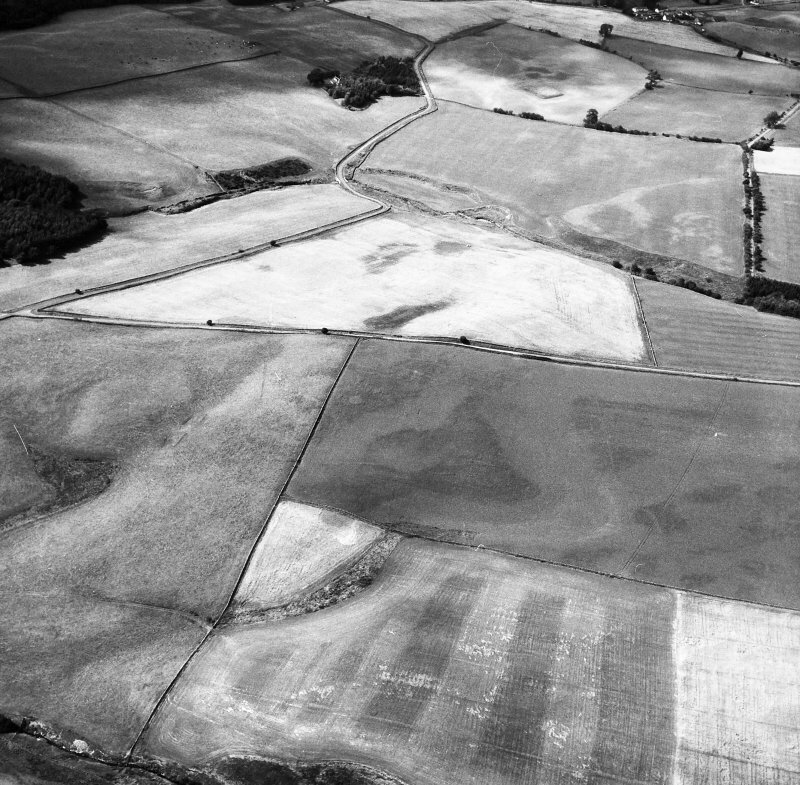 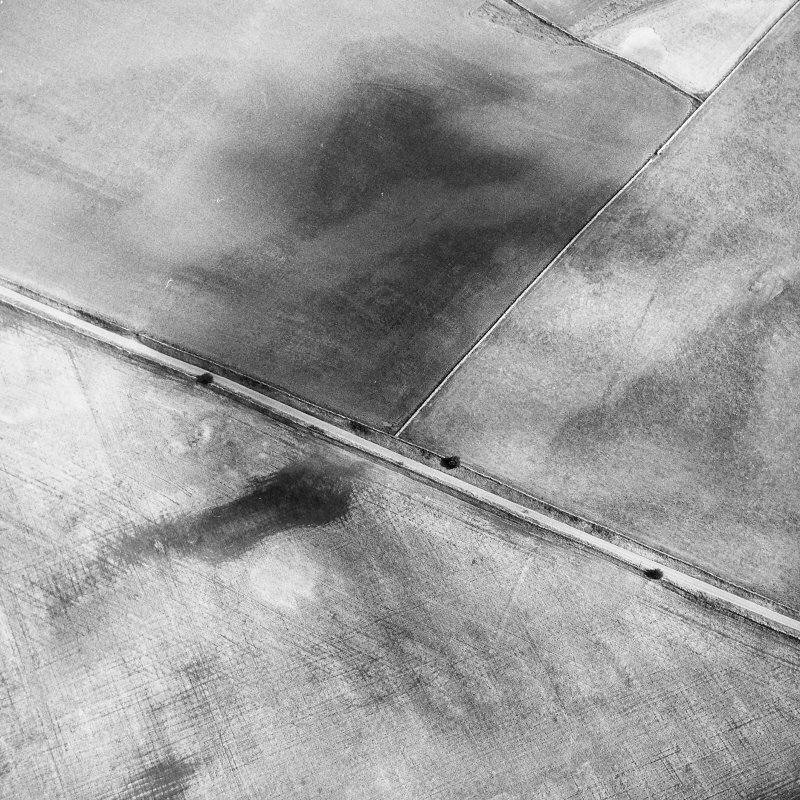 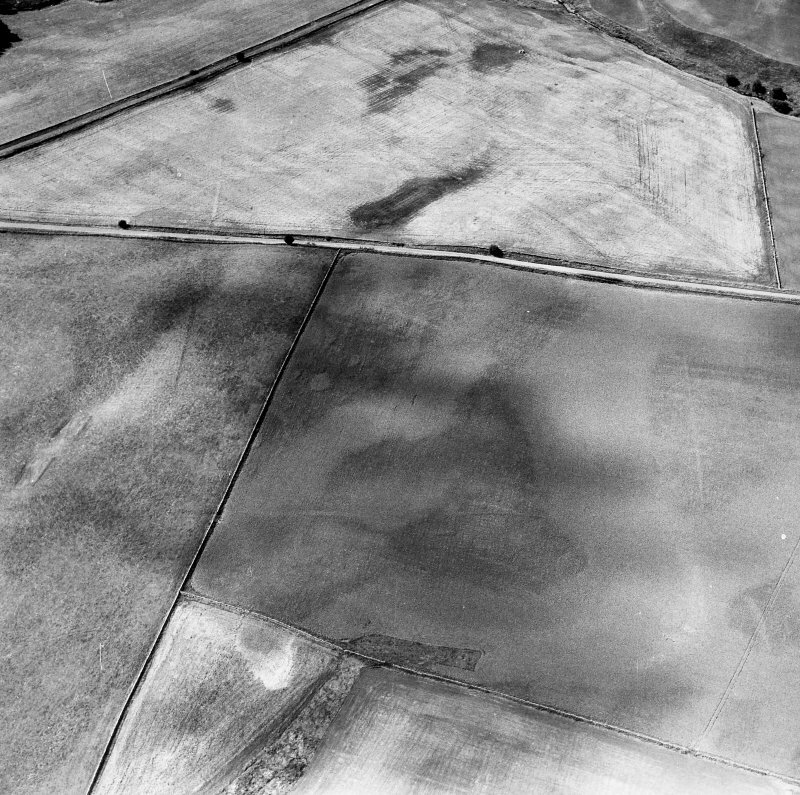 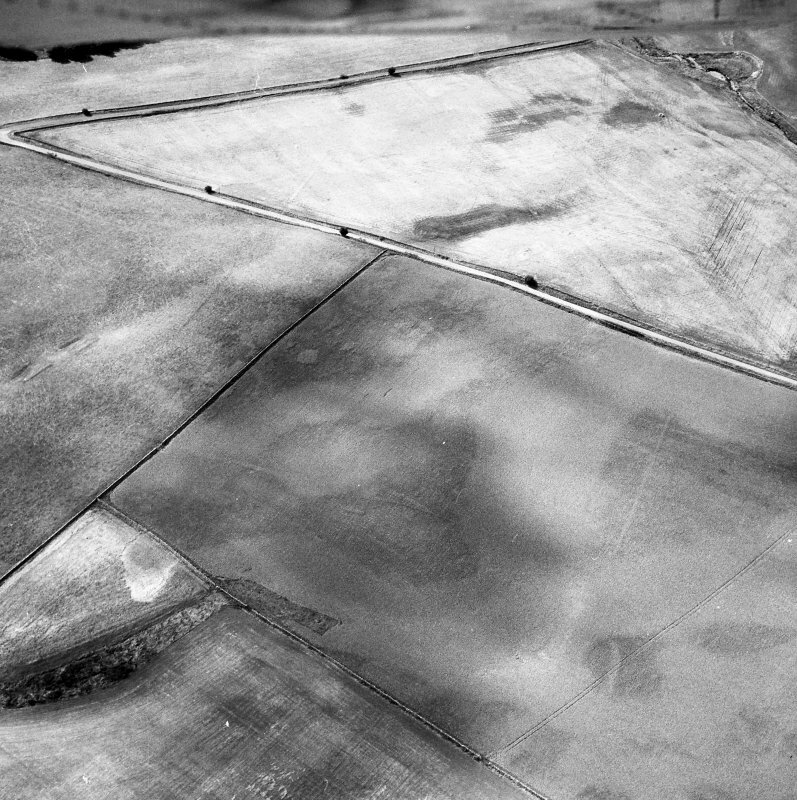 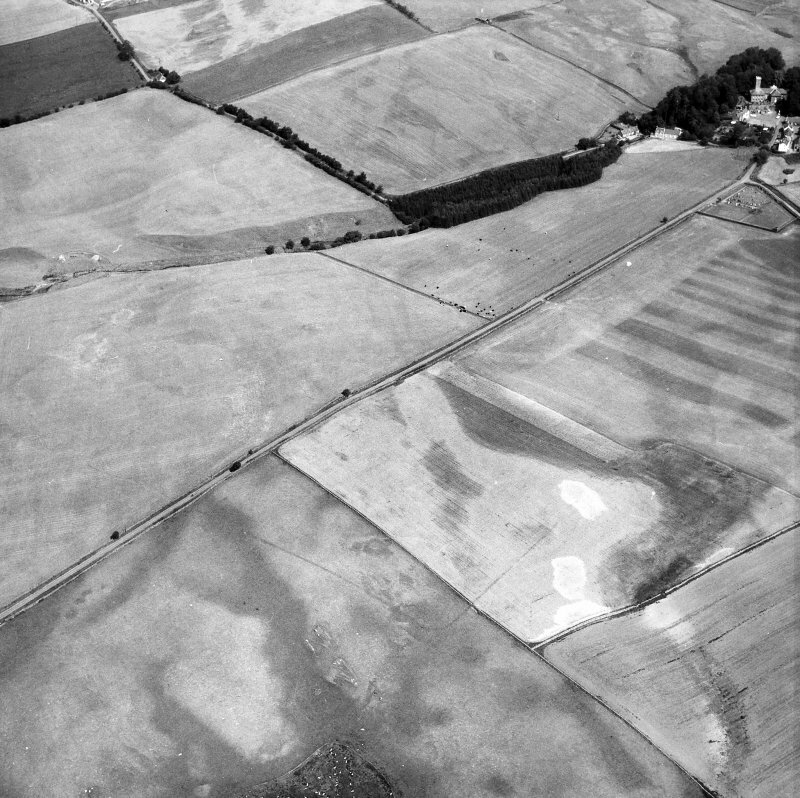 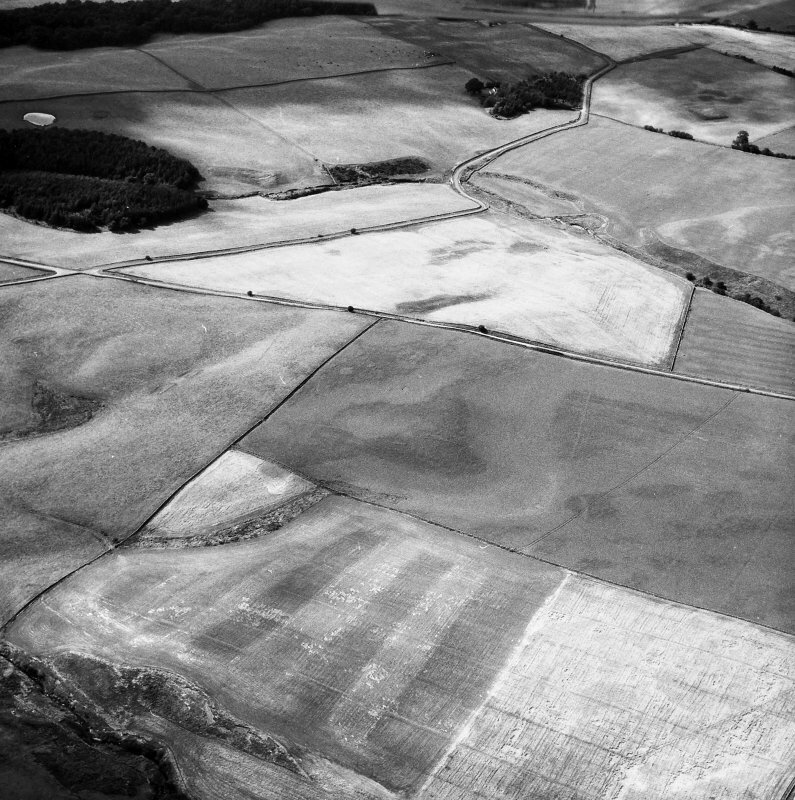 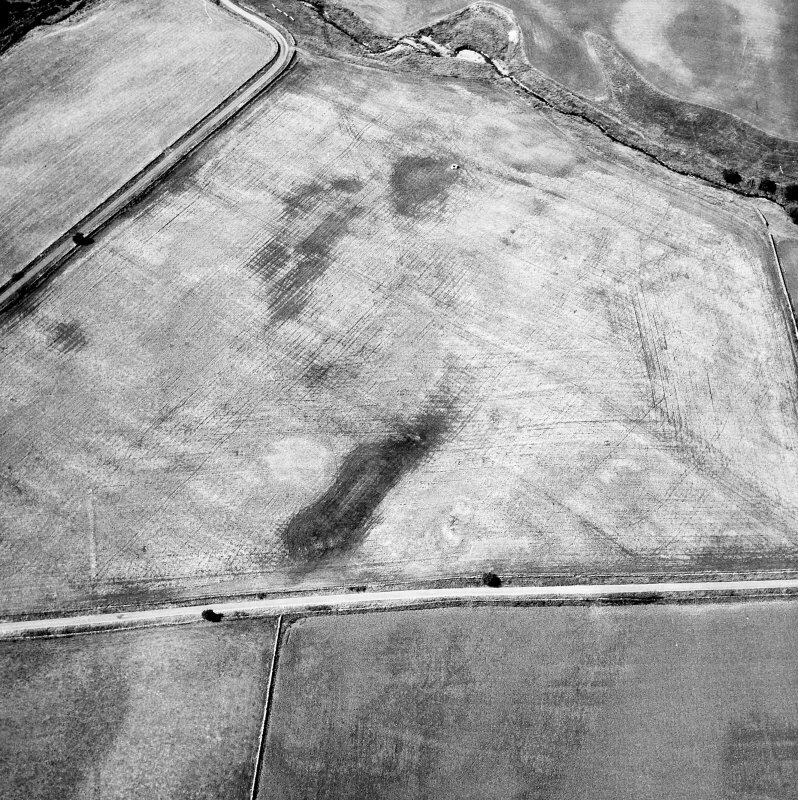 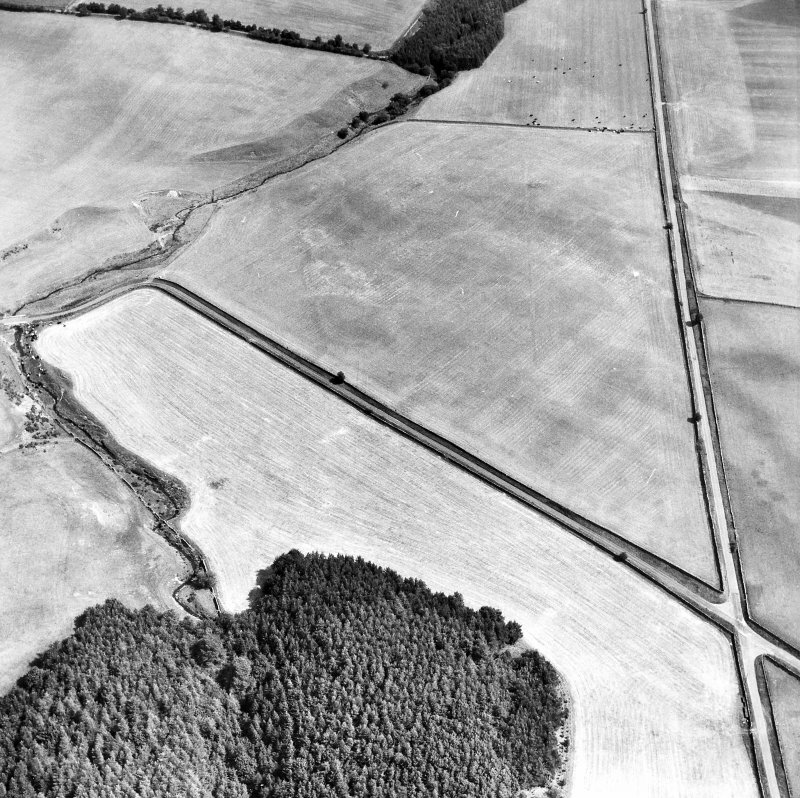 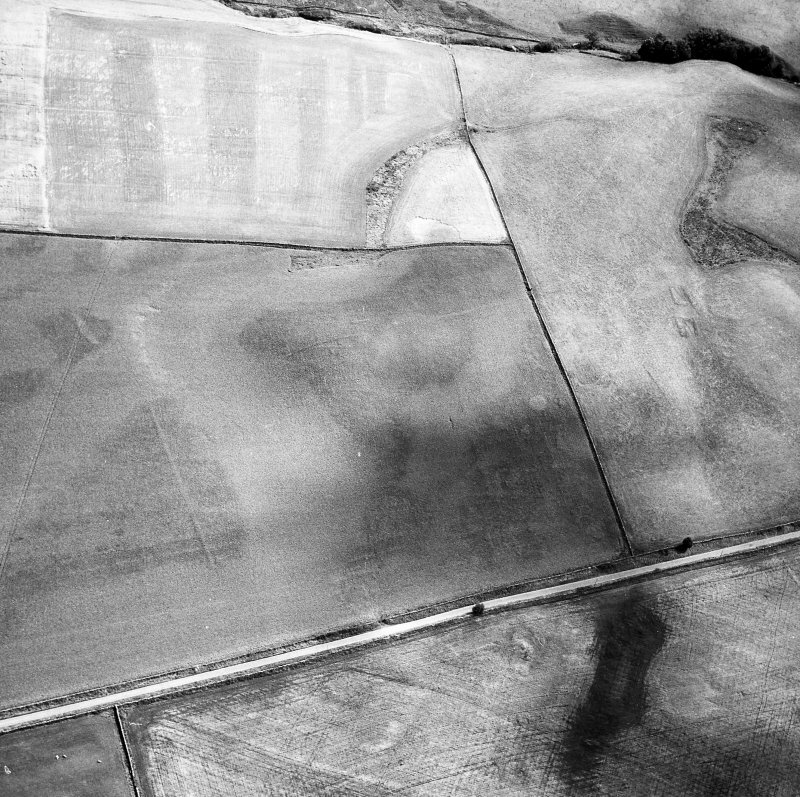 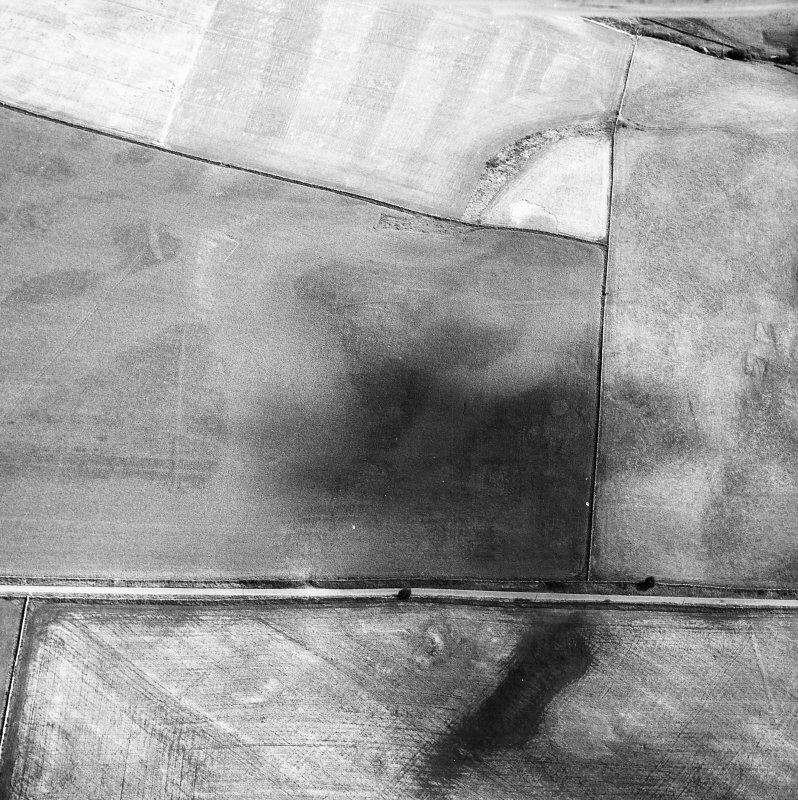 Oblique aerial photograph, taken from the E, centred on the cropmarks of a Roman Temporary Camp. 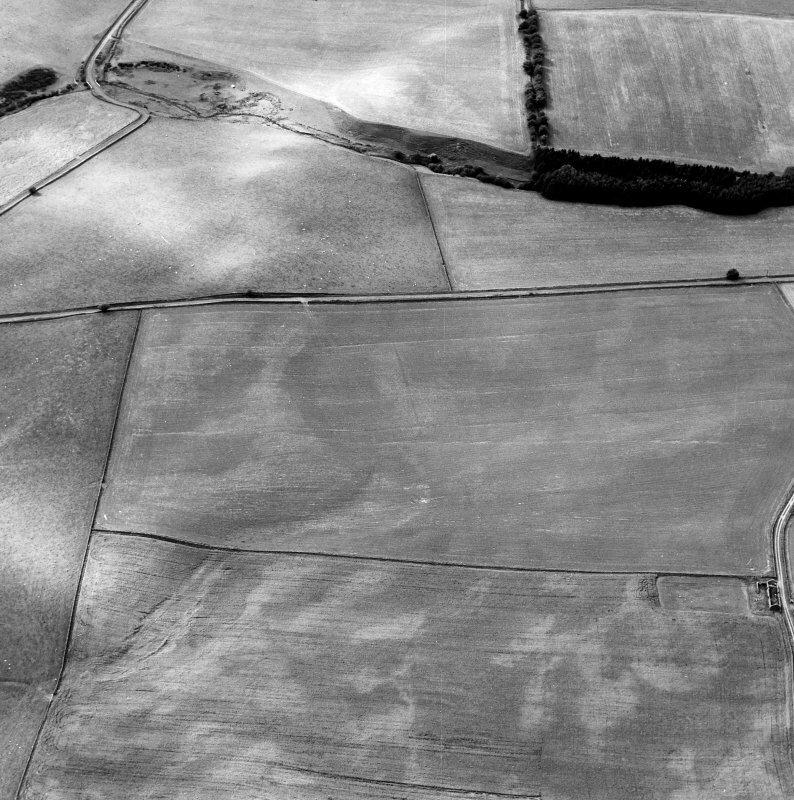 Oblique aerial view of Durisdeer, taken from the SSE, centred on the cropmarks of a Roman Temporary Camp. 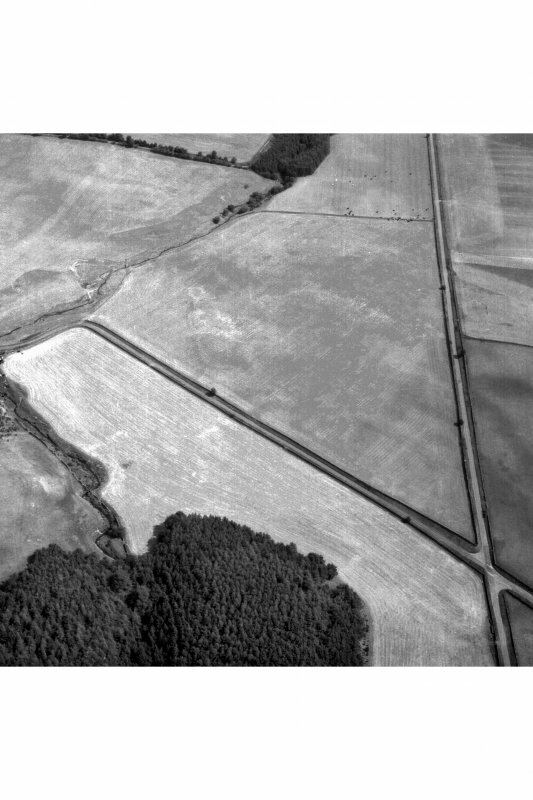 NS80SE 8.00 centred 8917 0314. 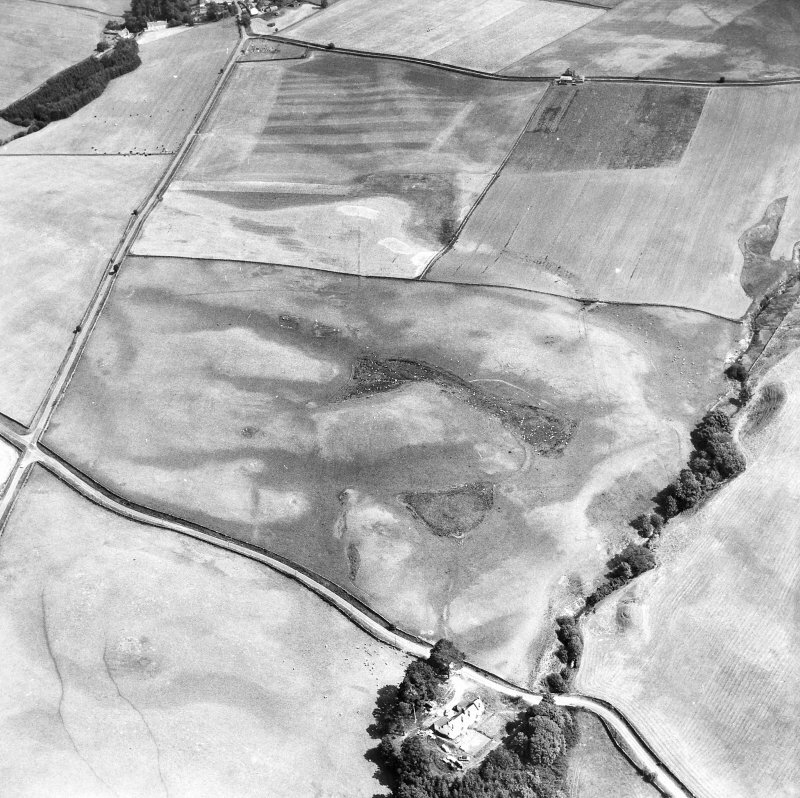 The sites of these camps fall in an area of uneven ground now under plough. 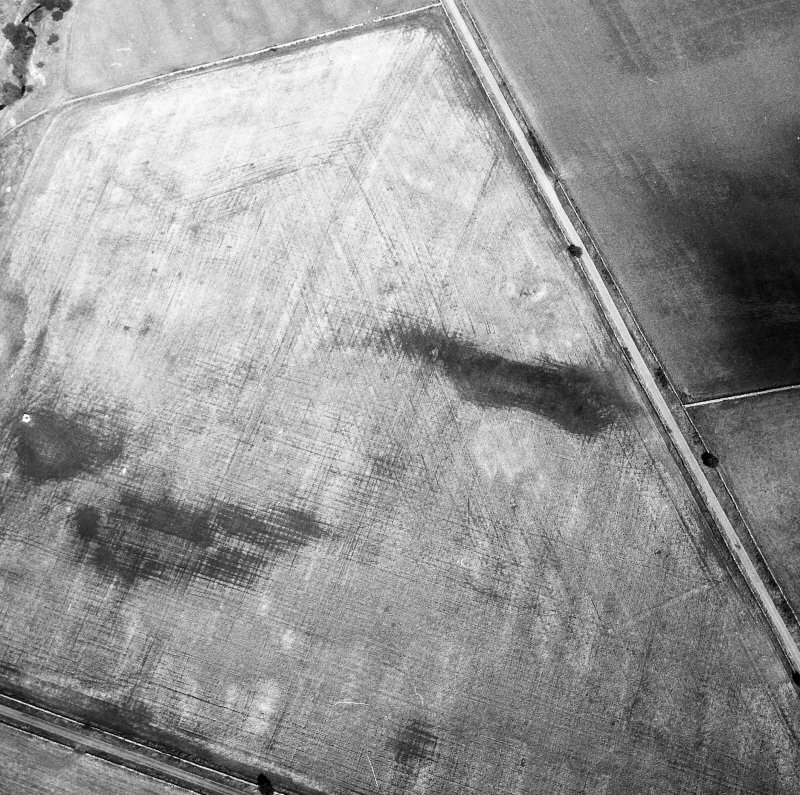 There are no ground surface remains to be seen. 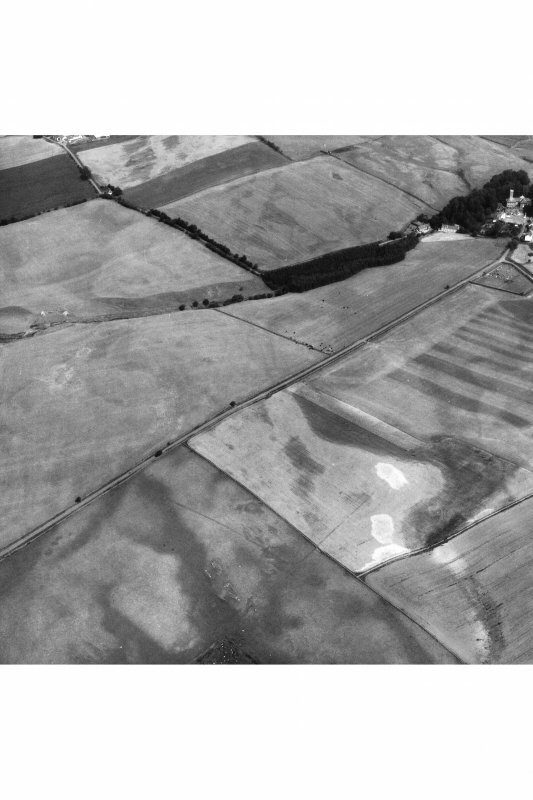 Discovered in 1949 by St Joseph from the air, the two camps at Durisdeer lie in pasture fields on a south-westfacing slope on the south-west side of the Lowther Hills, on the Roman road running from Drumlanrig in Nithsdale towards Crawford in Annandale. 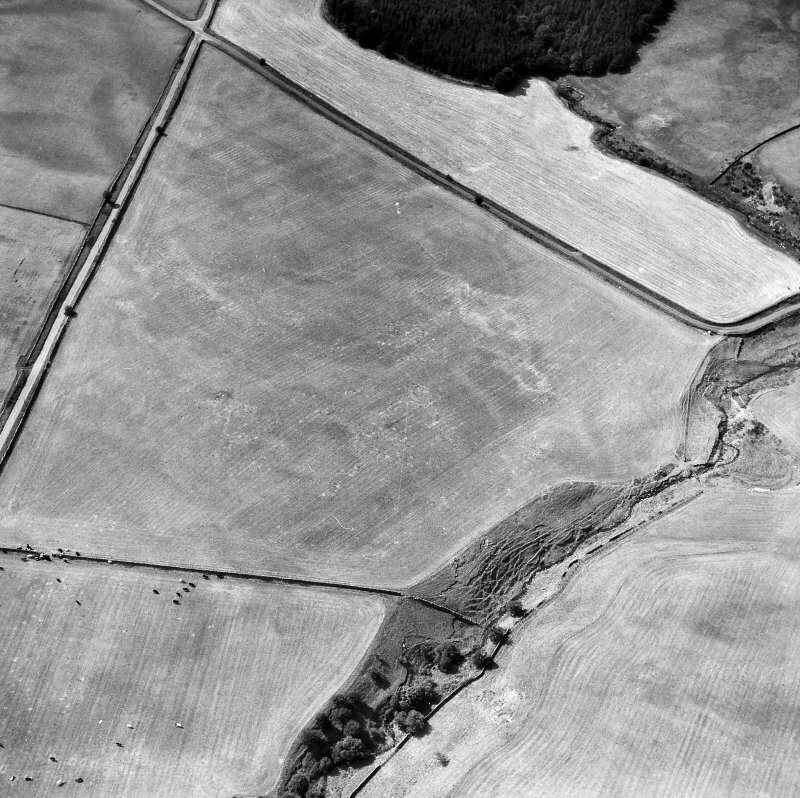 An Antonine fortlet lies some 2km up the Roman road to the northeast. 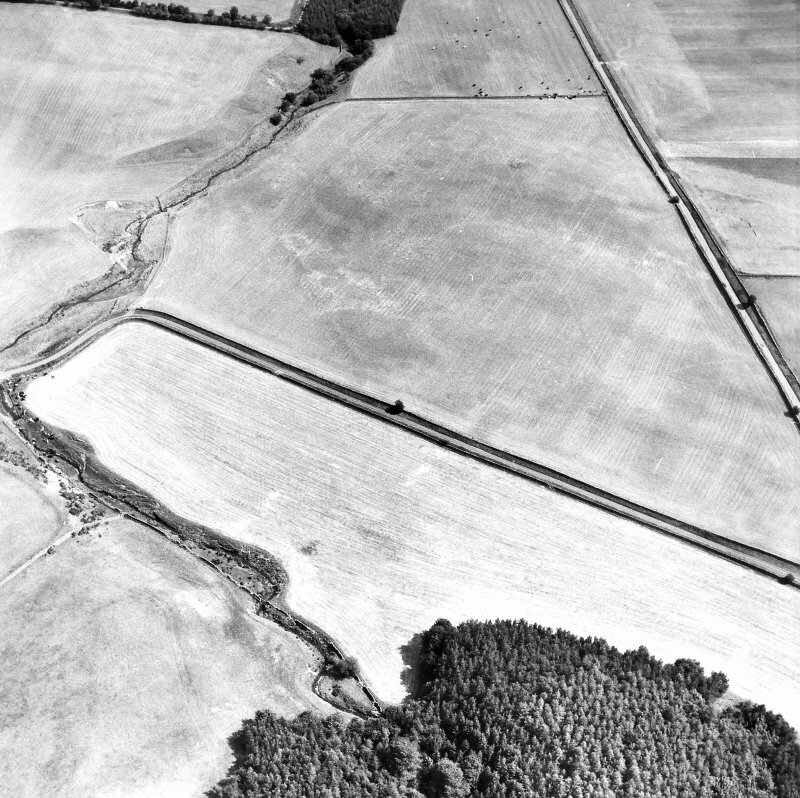 Camp II is wholly enclosed within camp I, and the modern road on the presumed line of the Roman road runs through both. 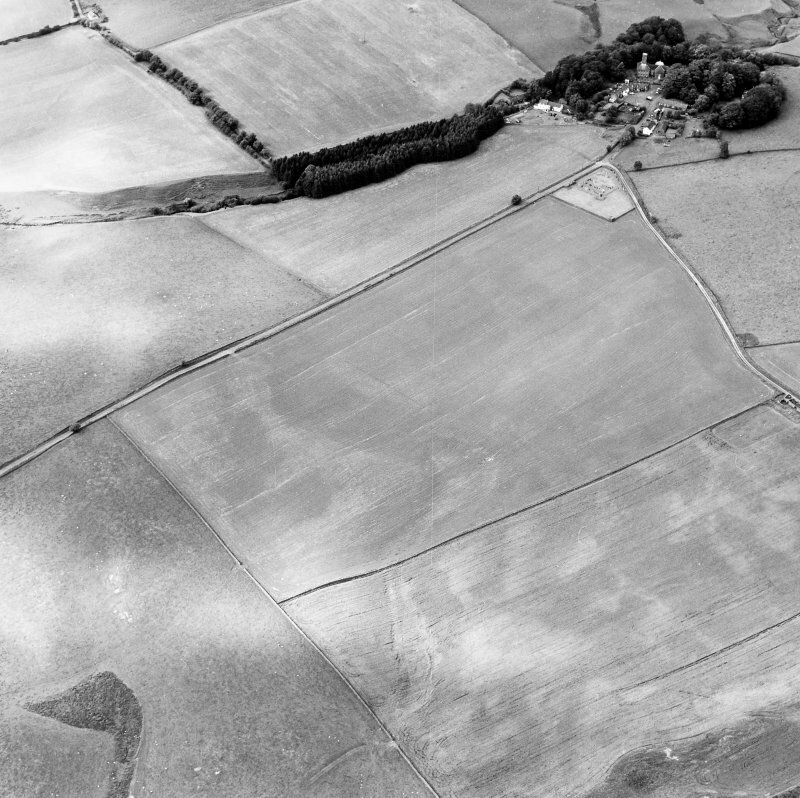 Camp I is almost square in form, measuring 474m from south-west to north-east by 460m enclosing 21.7ha (53.7 acres). 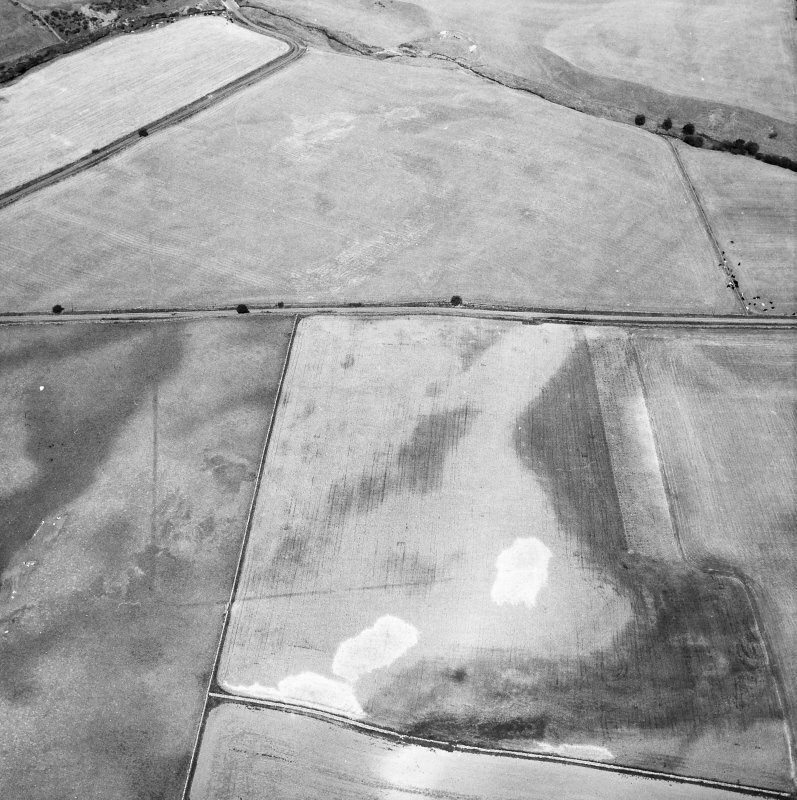 No entrances are known, but the cropmarks of the perimeter ditch are patchy because the camp has been recorded only in pasture. 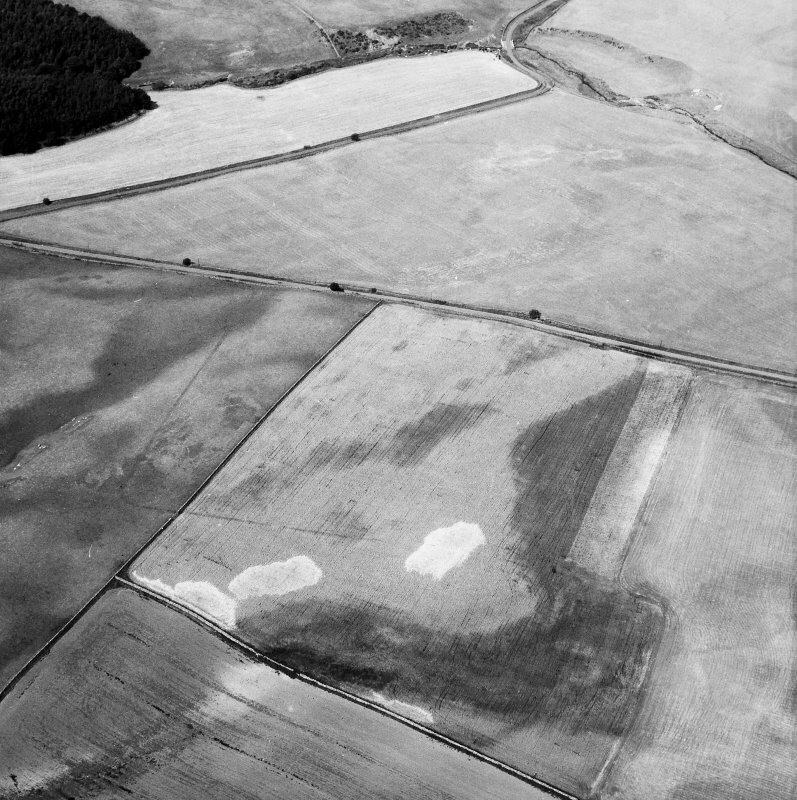 Camp II measures 246m from north-west to southeast by about 210m transversely, although the north-west end is wider than that to the south-east. 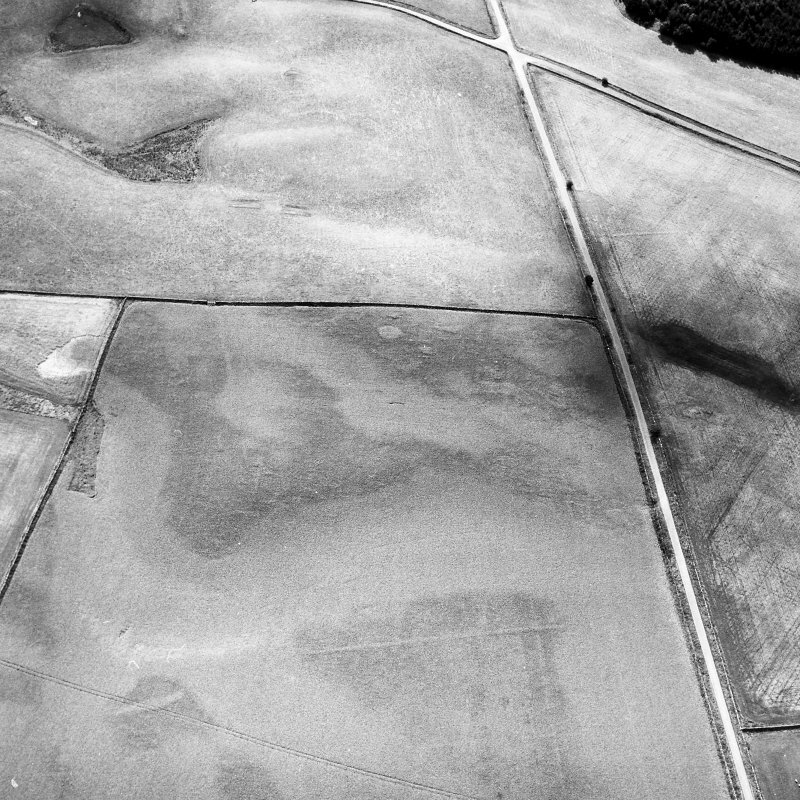 Some 5.1ha (12.7 acres) are enclosed, and entrance gaps protected by tituli are visible in the centre of north-west and south-east sides. 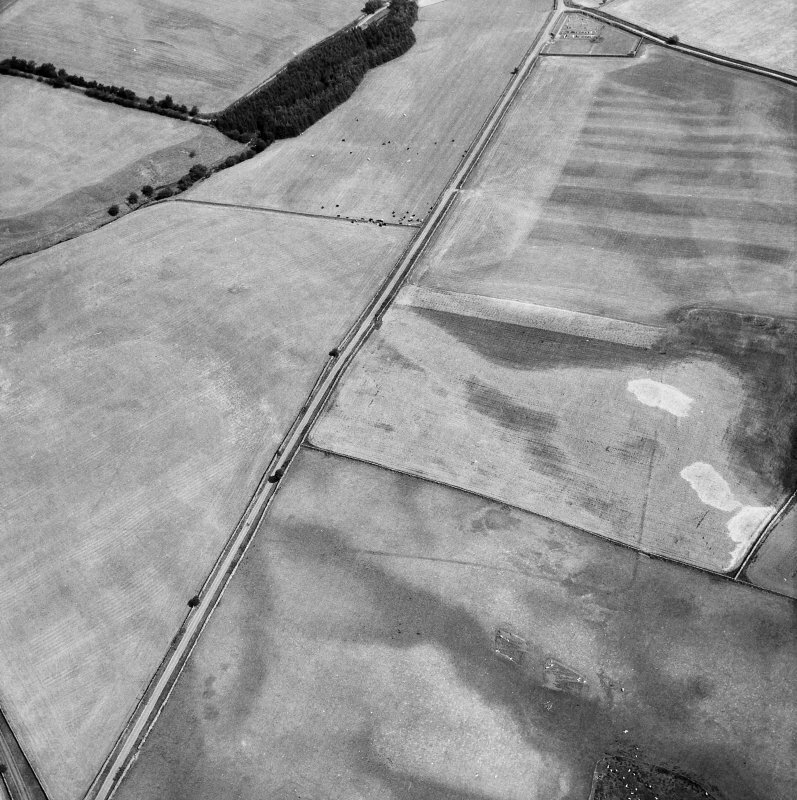 A further entrance gap is visible in the centre of the southwest side.